Husband and wife team Gayle and David Foulds operate two successful Prontaprint centres in Dublin that generate a combined €1.63 million turnover. After taking over the existing Prontaprint franchise on Leeson Street in 2001, the couple have worked hard to build up the business, and earlier this year seized the opportunity to invest in a second established franchise based on Tara Street. Gayle discusses their decision to invest and reveals what it is like running a business with her husband. Why did you look into franchising? Gayle: "We were not actively looking to invest in a franchise. When we moved from London to Dublin in 2001, we were looking for a new business venture within the city, as we still had to commute to London every week. The opportunity arose to invest in the Leeson Street-based Prontaprint centre and the fact that it was a reputable franchise brand appealed because we did not have any experience of running our own business or of the production side of printing. 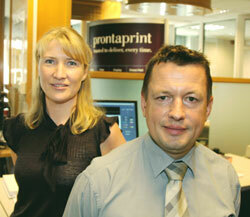 Knowing Prontaprint would provide us with ongoing training and support gave us the confidence to invest." Why did you and your husband decide to work together? Gayle: "We never set out to work together- it just worked out better for us to work together in the Prontaprint business, because we have different skills and experience- David used to be a management consultant while I have a background in PR and marketing." Do you find it difficult to separate your home and work life? Gayle: "We certainly did at first - we talked non-stop about the business. There was so much to discuss, that we did not get to discuss during the day when we were processing orders and dealing with customers and managing staff. We did that for about a year, then we realised it was becoming a bad habit, so we consciously decided to discuss it over the phone instead. "For the first few years, I worked part-time in the business so I would get home before David. I would call him during the day and we would go over anything that needed discussing. That way we could switch off when we were at home. We were always very strict about not discussing the business at all when on holiday. I work full time now and run our second Prontaprint Centre on Tara Street." How do you and David share the workload- do you both still play a hands-on role and are you looking to change this in the future? Gayle: "I do the administration across both Prontaprint centres. I have help from our office manager at Leeson Street and we employ a part-time bookkeeper to keep our accounts up to date. In addition to that, I manage the Tara Street centre. David runs and manages the Leeson Street centre. We have just recruited someone to work alongside David to free up some of his time to visit customers and to enable him to take a strategic view of the running of the two companies. "While we feel, it is important to be involved in our businesses on a day-to-day basis, we are making a few changes so that we don't get so involved that we can't take a step back and see what is going on." Why did you decide to invest in a second franchise- and why the Tara Street operation in particular? Gayle:"We had always worked quite closely with the previous owners of Prontaprint Tara Street as we sometimes used their large format facilities and we handled their litho printing for them, so we knew the business and staff well. When they came to the end of their franchise agreement and decided to move on, Prontaprint offered us the opportunity to take on the centre. "We had no previous plans to take on another centre but there were so many synergies between the businesses and so many reasons to say yes that we felt that it would be a missed opportunity if we let it go. The close proximity to Leeson Street was a definite advantage. We know the area and the sort of businesses around here, it's easily walked (or cycled now as we've just signed up to Dublinbikes) and we knew we'd go between centres so it was important not to waste too much time getting from a to b. We could also see the savings we could make in terms of bulk buying and spreading the costs over the two centres. "Prontaprint was very helpful in terms of identifying key differences in the way that the two centres operate and we knew that we could take the best of both and run both centres more efficiently. It is a great selling point to customers - having access to the facilities of both centres." What rewards are you working towards? Gayle: "Quality of life is very important to us. Our children are still in primary school, so with both of us working full time we want to ensure that we have enough free time to enjoy life outside of work, with our children, with each other and doing things we enjoy. We're trying hard to structure the business so that we have a bit more time at home and a bit more energy when we are at home. David's current objective is to get fit. Mine is to save enough to have a family holiday and visit friends in Toronto. Long term, we are saving for the children's education. The recession has certainly taught us to save when you have it."